Soudal Calofer is high-quality sealing paste based on sodium silicate that can be used in conditions where temperatures can get extremely high – up to 1500°C. Perfect for sealing applications in ovens, fireplaces, and other hot areas. Sealing of joints and openings where high temperatures are possible. Sealing of stoves, ovens, fireplaces, etc. Extrude / apply with standard caulking gun. Tool and apply extruded paste with spatula or putty knife. Calofer can be removed with water before curing. A slight warming of the heating installation during 12 hours after application prevents bubbleforming and improves structure. Do not apply in situations where constant water immersion is possible. 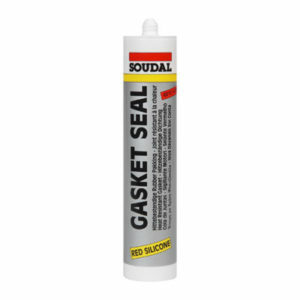 High-temperature, red silicone sealant for gaskets and heating installations. Up to 285°C.